Lots of great stuff happening this weekend, despite the possible (likely?) snow! Get out and about and enjoy the time with family at one of these events! UPDATE, DECEMBER 7TH – The Sapulpa Christmas Parade, which was previously canceled due to the threat of winter weather, has been reinstated as of this morning. See details below! Jingle’n’Mingle on Route 66 sponsored by Sapulpa Main Street from 5:30 to 8:30 p.m. in downtown Sapulpa. Come enjoy Old Town Christmas charm at this Jingle-n-Mingle Holiday Shopping event! The evening will include horse-drawn carriage rides, photos with Santa, and promotions and refreshments from the unique shops in the downtown district. Carriage rides are $5 for adults, $3 for children 6-12, and free for children 5 years and younger. Private carriage rides are $10 for adults, $5 for children 6-12, and free for children 5 years and younger. Photos with Santa are $5. For more information please visit the Facebook page here. Sapulpa Historical Society Museum Open House from 5:30 to 7:30 p.m. at 100 East Lee Avenue in Sapulpa. Time for an ol’ fashioned Christmas with the Sapulpa Historical Society! 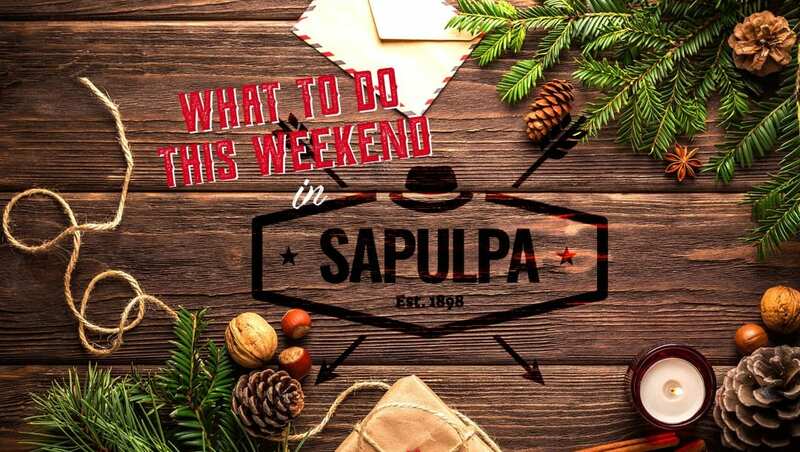 They will have Jingle Bell tickets, hot apple cider, desserts, and wonderful docents to greet you during your tour of Sapulpa history. For more information, please visit the Facebook page here. Elks Monthly Fish Fry from 5 to 7:30 p.m. at the Elks Lodge, 24 South Poplar Street in Sapulpa. Come join us for our monthly fish fry for only $7.50 a plate! You’ll find good food, good times, and great people! For more information please call 918-224-1118. 2nd Annual Green Hill Funeral Home Living Tree Memorial beginning at 6 p.m. at Green Hill Funeral Home, 400 East Teel Road in Sapulpa. The Living Tree Memorial is dedicated to the memory of our loved ones and will memorialize them during the holiday season and throughout the years. If you would like to place an ornament on the tree, bring it with the name of your loved one on it at 6 p.m. The service will begin at 7 p.m. In addition to the tree ceremony, there will be caroling, special music, a visit from Santa Claus, and a special candlelight remembrance in memory of your loved ones. They will also be accepting new, unwrapped toys and nonperishable food items to donate to Caring Community Friends. For more information, please call the funeral home at 918-224-2312. Yes Virginia, There Is a Santa Claus! from 7:30 to 10 p.m. at the Sapulpa Community Theatre, 124 South Water Street in Sapulpa. “Dear Editor, is there a Santa Claus?” 8-year-old Virginia O’Hanlon writes to “The New York Sun.” The editor’s response becomes one of the most memorable and cherished editorials in newspaper history. To get your seats for this family-friendly Christmas classic visit www.our.show/yesvirginia or call 918-227-2169. For more information please visit the Facebook event page here. Breakfast with Santa hosted by Ovations Studio & Gym at 9 a.m. at the Sapulpa High School. Breakfast will be served from 9 to 10:30 a.m.. Tickets are $5; children 4 and under are free. Tickets can be purchased at Ovations or CASA. Ovations competitive dancers and cheerleaders will perform in the auditorium at 10:30. Admission to the show is a gift for the Angel Tree at the Ovations Pro Shop. For more information, please visit the Facebook page here. Tai Chi: Moving for Better Balance, a FREE 12-week program (this is the last week!) at 10:30 a.m. on Saturdays at the Good Shepherd Episcopal Church, 1420 East Dewey Avenue. This class will be taught by certified Master Instructor Gina Wozencraft. For more information on this program, please call Ms. Wozencraft at the Creek County Health Department in Sapulpa at 918-224-5531, extension 284. CANCELED – Yes Virginia, There Is a Santa Claus! The Saturday 2pm showing of this classic has been cancelled, but other showtimes are still available! To get your seats for this family-friendly Christmas classic visit our.show/yesvirginia or call 918-227-2169. For more information please visit the Facebook event page here. Sapulpa Toy Run from 4:30 to 7 p.m. at Westlake Ace Hardware, 715 South Main Street in Sapulpa. Donate a new, unwrapped toy for a deserving child before the Christmas Parade! For more information, please visit the Facebook page here. CANCELED; WILL NOT BE RESCHEDULED – Sapulpa Chamber Christmas Parade presented by SeneGence beginning at 6 p.m. This year’s theme is “Christmas at the Movies.” Be sure to come out to see all the floats and to see if your favorite holiday film is represented! This is a annual community tradition you won’t want to miss. Yes Virginia, There Is a Santa Claus! from 2 to 5 p.m. at the Sapulpa Community Theatre, 124 South Water Street in Sapulpa. “Dear Editor, is there a Santa Claus?” 8-year-old Virginia O’Hanlon writes to “The New York Sun.” The editor’s response becomes one of the most memorable and cherished editorials in newspaper history. To get your seats for this family-friendly Christmas classic visit www.our.show/yesvirginia or call 918-227-2169. For more information please visit the Facebook event page here. Santa Sleigh 5k Benefitting Glenpool Christmas Shoppe on Saturday at 9 a.m. at Crossfit Bellator, 821 East 141st Street in Glenpool. Crossfit Bellator is partnering up with Glenpool Cross Country for this fun, seasonal event. The entry fee is an wrapped toy. They will also be collecting monetary donations and gift cards, all of which will support the Christmas Shoppe. For more information, please visit the Facebook page here. Kellyville Christmas Parade at 11 a.m. in Kellyville. This year’s theme is “Christmas in Toyland.” Don’t miss this fun and festive event! Glenpool Community Christmas Shoppe December 9th through 12th. Put a Christmas smile on hundreds of kids by providing free Christmas presents for their parents and guardians to choose from! You can also sign up to help as a greeter, personal shopper, gift wrapper, and more. For more information, please contact Jason Yarbrough at 918-576-3431 or vjyarbrough@sbcglobal.net. You may also visit the Facebook page here.